Inside Mexico City’s Arena Mexico, everything was noise and mayhem. The crashing sound of bodies hitting the floor. The loud crack when one wrestler’s ankle impacted another wrestler’s neck. Ear-piercing, guttural shouts from spectators around the room. Bikini girls dancing. The announcer booming. Vendors chanting. Lights flashing. Music blaring. During the Lucha Libre, there was so much to see and yet nowhere to look because everything demanded my attention at once. Everything was mayhem. Attending my first Mexican wrestling match, I fought to stay focused on the wrestlers and understand the game, but my eyes darted around the room, distracted by people jumping up from their chairs to shout and vendors coaxing me to buy cotton candy. My friend Daniel sat next to me, fixated on the ring. 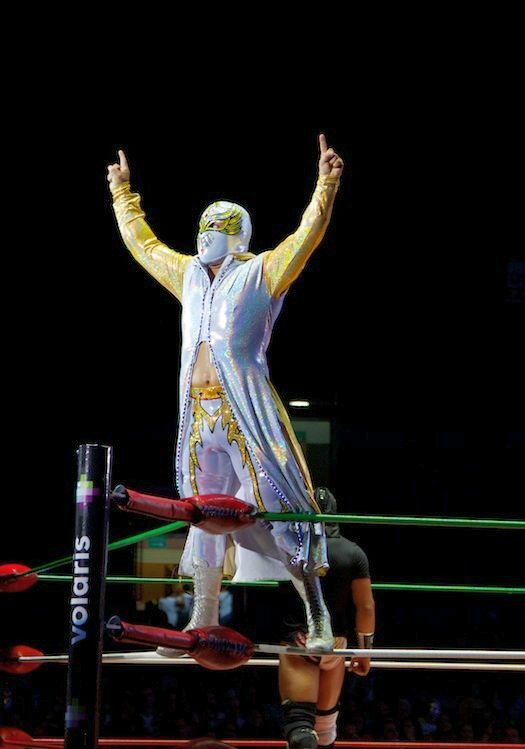 Between matches, he broke focus to explain that he and his brother had been wearing Speedos to bed since they were children because they idolized Mexico’s infamous wrestling scene so much, as many children in Mexico do. I asked him whether or not he still sleeps in Speedos; there was a long pause before he shook his head and looked away with a coy smile. Daniel is over 30 years old and a pretty bad liar. As he spoke, I looked around the arena and spotted fathers with their mask-and-cape wearing children hoisted up on their shoulders. The children also waved miniature Lucha Libre dolls in the air and cheered as loudly as anyone else in the stands, if not louder. It’s pretty surprising when you hear a three year-old scream, “kill him!” Not in this realm, though. To those foreign to the game, the rules and antics of Lucha Libre make very little sense if you don’t at least know the basics before you attend. As I watched, one wrestler sprinted at full-speed across the ring then dove into the ropes, rebounded, tucked and rolled, rebounded again off the ropes on the other side of the ring, front flipped, then from the air managed to lock his ankles around another wrestler’s neck who then spun him around in a circle before throwing him to the floor. At another moment, someone climbed up on the ropes in the corner of the ring, back flipped off the edge of the platform, and landed on the shoulder of another wrestler below. This is why my friend told me as a spectator not to sit in the first couple of rows: bodies sometimes come flying over the rails, smacking audience members in the face, or worse. In the midst of all the tumbling, a duo of costumed midgets entered the ring, one of them dressed as a white toga-wearing fuzzy blue monkey and the other as an eagle. Suddenly, when a wrestler fell off the side of the ring, the blue ape midget did a flying squirrel off the edge to belly flop on top of him. The crowd went insane. Then, the midget climbed back into the ring, ran up to the other midget, and pushed him down. When he turned around to cheer with his hands raised in the air, the other midget got up and kicked him full-force in the back, sending him flying across the ring where he landed face down at the feet of a wrestler who body slammed on top of him. Reminder: none of the midget tomfoolery has anything to do with anyone winning the match, which is exactly why I felt lost. I turned to Lucha Libre commentator Julio Rivera to try to understand the game. Basically, he explained, there are two teams: the good guys versus the bad guys. Los técnicos are the good guys and they play according to the rules versus los rudos are the bad guys and they play dirty. People cheer equally for both sides. Typically, the match is comprised of around six fighters (three from each team), but that’s where things get confusing. Unlike American wrestling, a fighter doesn’t have to tag their partner into the ring to fight one at a time, instead they just come and go as they please. So, there might be multiple people fighting each other at the same time inside and outside of the ring. Just like wrestling in the United States, a match is won by pinning someone down for a count of three. In Lucha Libre, though, there are also a number of automatic disqualifications that can end the game, like ripping someone’s mask off. 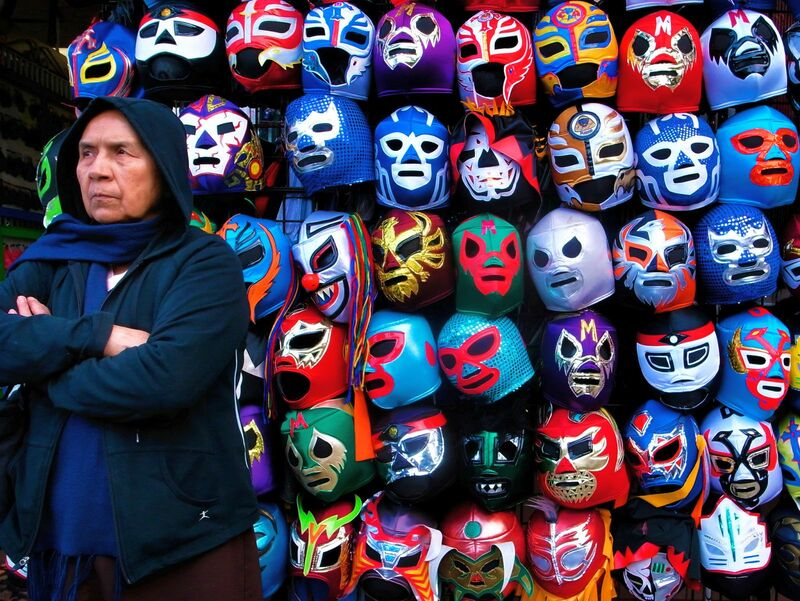 It’s so important for a luchador to keep his identity disguised, there are rumors that some famous wrestlers even wear their masks in public during casual jaunts to the movies or to the grocery store. Let’s be honest: when you’re there for catharsis and are yelling for both teams, who wins doesn’t matter so much, especially since sometimes it’s hard to tell who wins and why at all. At the very end of my match, all of the wrestlers were in the ring throwing each other around when suddenly I heard the referee call it. Just like that, the match ended, a team got booed off stage, and everyone inside the stadium started to quickly file out of their seats at the same time. “Wait, what happened? Who won?” I asked Daniel. “Oh, someone ripped another person’s mask off, which disqualified them. So the match is over,” he said. “Oh,” I shrugged. It was a very anticlimactic ending to it all. So I joined the line of masked revelers from the audience filing out the door, looked around at all the people still cheering, and felt very happy to be leaving in one piece because I did not sit in the front row. Want to master a couple self-defense moves from some of Mexico’s city most famous Lucha Libre fighters? Watch this video of writer Megan Snedden hopping into the ring with Luchadores Místico and Caristico. Travel writer and photographer Megan Snedden once wore a mask through a Taco Bell drive-thru, which fueled her cultural fascination with costumed performers. Follow her on Instagram at @MeganSnedden, or read her stories at MeganSnedden.com.